Joining the cult of ‘clean living’ in 2014, it took just under two years for Daniella Isaacs to realise that her obsession with health was, in fact, the very thing that was making her sick. 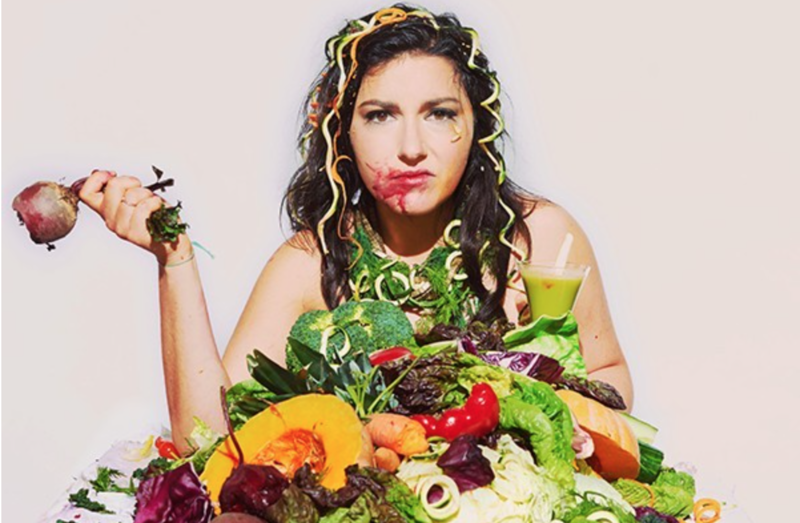 Her startlingly honest one-woman show ‘Hear Me Raw’ laid bare the messy reality of orthorexia nervosa, showing how easy it can be to be seduced by the claims of the wellness industry to the point of self destruction. Running 5k every day and following a gluten-free, sugar-free, dairy-free, fat-free (fun-free?) diet, Isaacs became increasingly unwell, both physically (she developed osteopenia and amenorrhea), and mentally. Taking shots of ginger and snorting turmeric powder, Issaacs emphasises the truly addictive nature of obsessive control over food, using it to numb the pain of loss and block out the fear of life’s uncertainties. Daniella begins by talking the audience through the miraculous properties of each of the ‘superfoods’ lined up neatly on the table before her, each glistening with panaceaic promise. However, as the play progresses the various kitchen gadgets and health food packets take on the role of the eating disorder’s voice, taunting and bullying Daniella, only silenced by her compliance with their growing demands and increasingly restrictive rules. We see Issaacs wrestling to justify her behaviours to herself and others, and as cracks start to appear in her reasoning the ugly truth of the disorder begins to expose itself. Far from solving all her problems, her life appears to be spiralling rapidly downhill. Concealing disordered eating behind the guise of ‘clean living’, Issaac’s obsession with ‘wellness’ has sapped her energy, stolen her money, ended relationships and ultimately consumed years of her life. By the end of the performance, Issaacs comes to see the true nature of her ‘healthy’ lifestyle, and we watch her begin to fight back, reclaiming her own voice and identity. Far from a sugar-coated ending, Daniela repeatedly emphasises her ongoing mental battle, and struggle to accept herself and her body. However, as she ends her performance by blending a collection of ingredients epitomising true freedom and wellness, the audience breaths a collective sigh of relief. A refreshing perspective on a lesser-known mental illness, this autobiographical play refuses to romanticise, sentimentalise or indulge in self-pity. Rather, as we watch Daniella lose and then begin to regain her power over her own mind and body, we are reminded of the darker side of the current health trends and new wave of fad dieting led by self-proclaimed internet experts. - Laura Marsh is a Research assistant, Department of Academic Neuropsychiatry, King's College London.